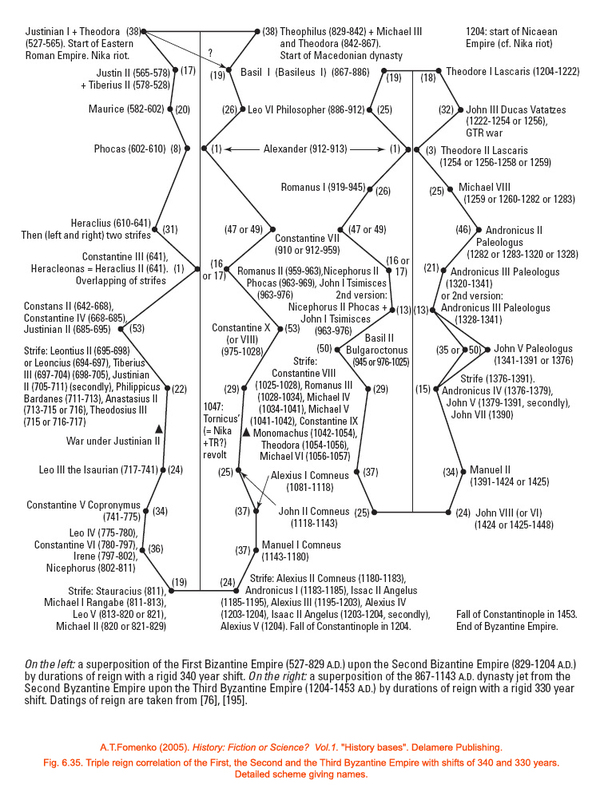 The “New Chronology” (or NC) is a scientific current led by mathematicians Anatoly T. Fomenko, Gleb V. Nosovskiy and their collaborators. 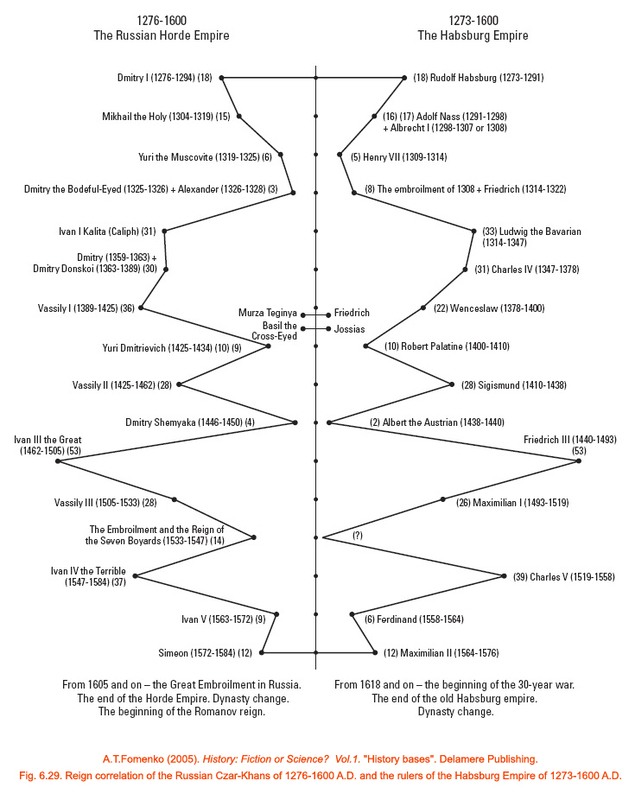 It is based on a research project begun in the 1970s, and it propose to integrate the knowledge of astronomy and modern statistical mathematics into the exploration of the chronological structure ordered by global history, until the 17th century. 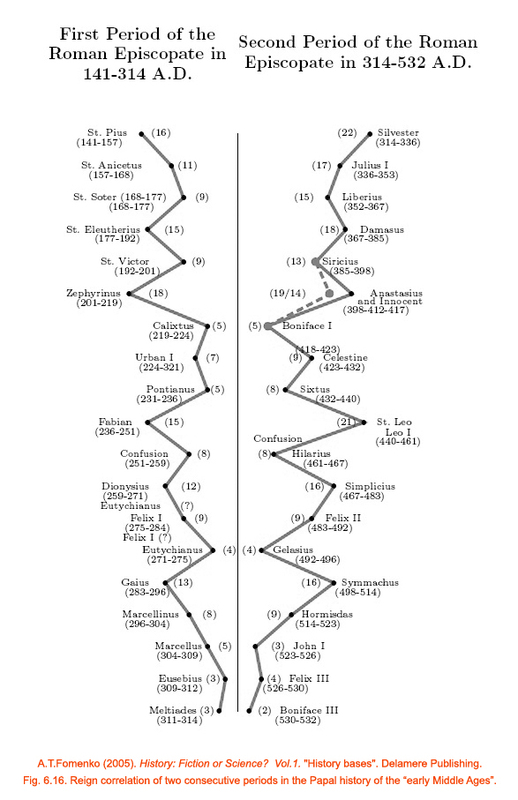 In doing so, it questions the official chronology proposed by the religious Joseph Justus Scaliger (1540-1609) and Dionysius Petavius (1583-1652), and links to the work already explored by other scientists, such as Isaac Newton (1643-1727) or Nicolay Alexandrovich Morozov (1854-1946). The NC presents an alternative chronology of history with a comprehensive reconstruction of the events that are structured, in order to deepen its study and invite the international scientific community to join the project. It is presented as a theoretically hypothesized and experimentally verified with scientific methods. 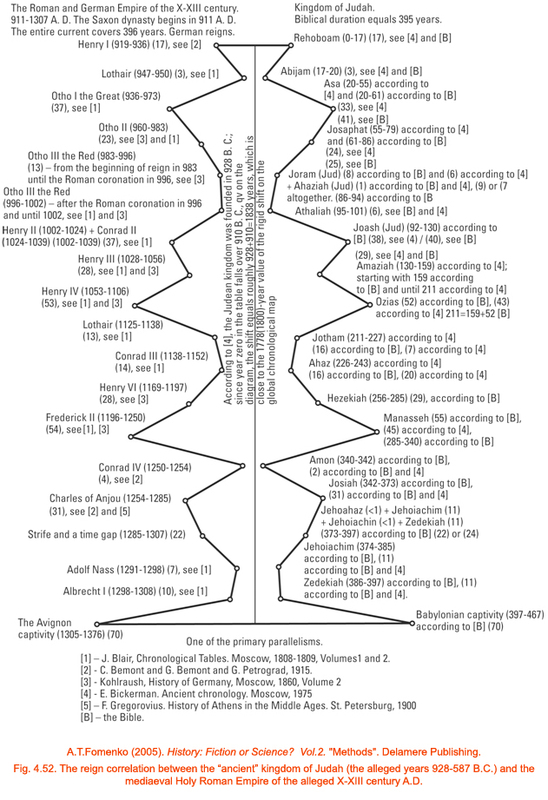 His results are questioned especially by the historiographic estate, insofar as it concludes that the central axis of the official chronology is the result of a manipulation and numerous accumulated errors, and that is hard to accept. But his criticism avoids the evidence of the data obtained, which shows that common dating systems have been structured around a wrong chronology and that, therefore, the real story is different from the official. To spread it and to collaborate with its study is an act of personal coherence, assumed from the moment in which the evidence of the NC is superior to the resistance (denial) that foments the official history. 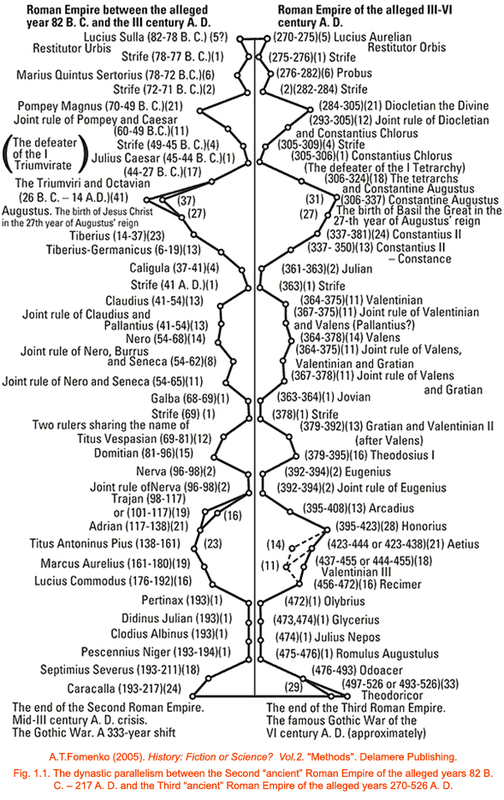 Dynastic parallelism 01 (Click) The dynastic parallelism between the Second “ancient” Roman Empire of the alleged years 82 B. C. – 217 A. D. and the Third “ancient” Roman Empire of the alleged years 270-526 A. D.
Dynastic parallelism 02 (Click) The reign correlation of the “ancient” Biblical kingdom of Israel and the Third “ancient” Roman Empire. 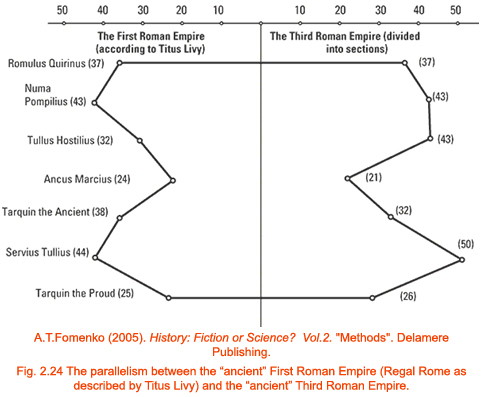 Dynastic parallelism 03 (Click) The parallelism between the “ancient” First Roman Empire (royal Rome as described by Titus Livy) and the “ancient” Third Roman Empire. Dynastic parallelism 04 (Click) The parallelism between the Second Roman Empire of the alleged I century B.C. 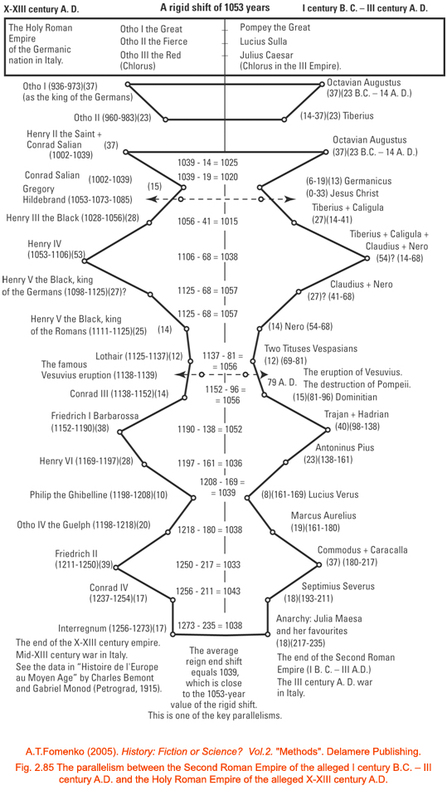 – III century A.D. and the Holy Roman Empire of the alleged X-XIII century A.D.
Dynastic parallelism 05 (Click) The parallelism between the “ancient” Third Roman Empire of the alleged III-VI century A.D. and the Holy Roman Empire of the alleged X-XIII century A.D.
Dynastic parallelism 06 (Click) Reign correlation between the “ancient” kingdom of Israel (the alleged years 922-724 B.C.) 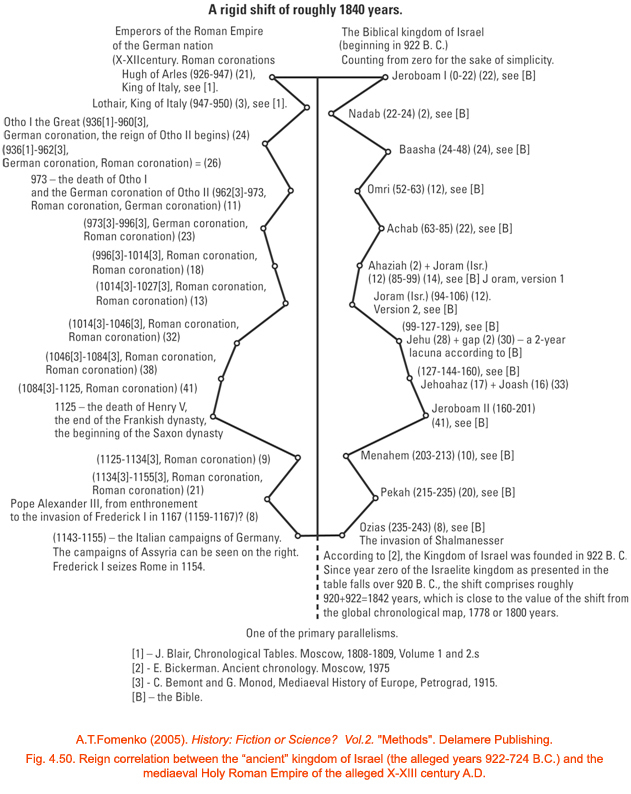 and the mediaeval Holy Roman Empire of the alleged X-XIII century A.D.
Dynastic parallelism 07 (Click) The reign correlation between the “ancient” kingdom of Judah (the alleged years 928-587 B.C.) 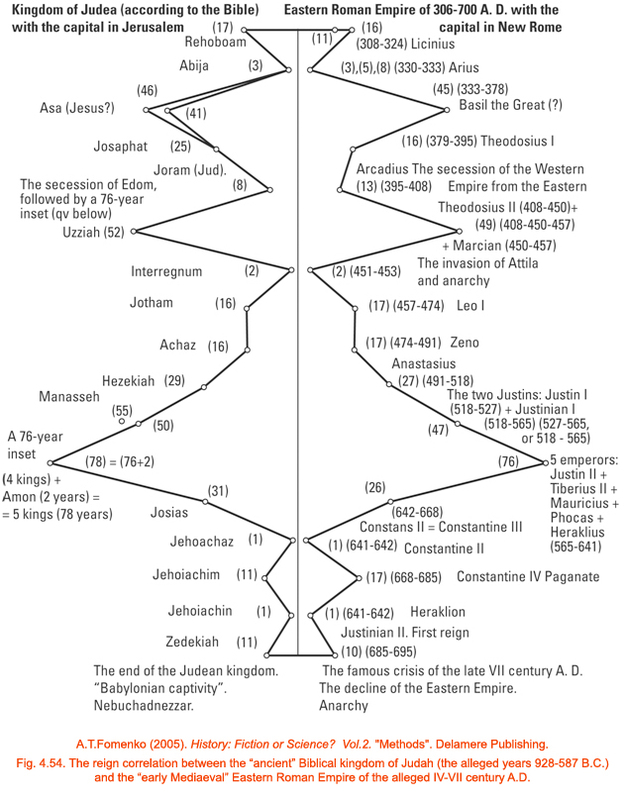 and the mediaeval Holy Roman Empire of the alleged X-XIII century A.D.
Dynastic parallelism 08 (Click) The reign correlation between the “ancient” Biblical kingdom of Judah (the alleged years 928-587 B.C.) 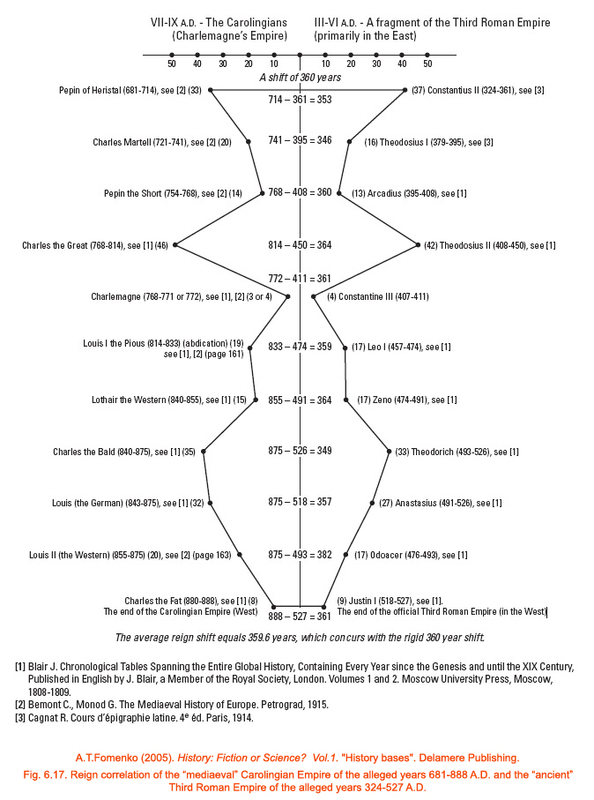 and the “early Mediaeval” Eastern Roman Empire of the alleged IV-VII century A.D.
Dynastic parallelism 09 (Click) Reign correlation of two consecutive periods in the Papal history of the “early Middle Ages”. 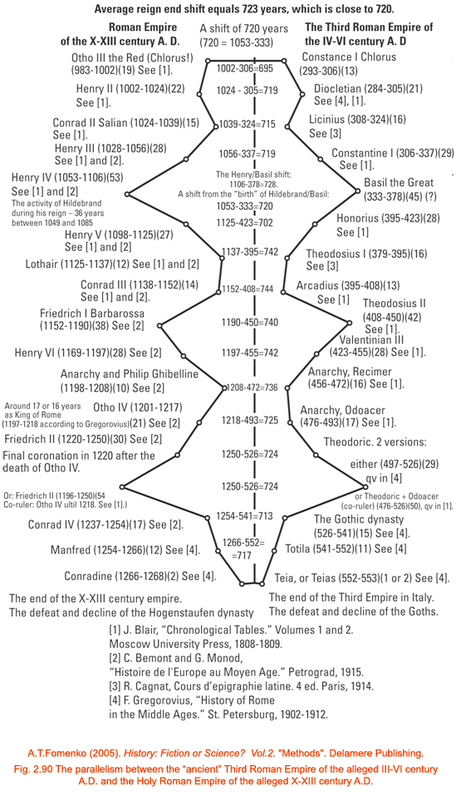 Dynastic parallelism 10 (Click) Reign correlation of the “mediaeval” Carolingian Empire of the alleged years 681-888 A.D. and the “ancient” Third Roman Empire of the alleged years 324-527 A.D.
Dynastic parallelism 11 (Click) Reign correlation of the mediaeval Holy Roman Empire of the alleged X-XIII century A.D. and the mediaeval Habsburg Empire of the XIII-XVII century with a rigid shift of about 360 years. 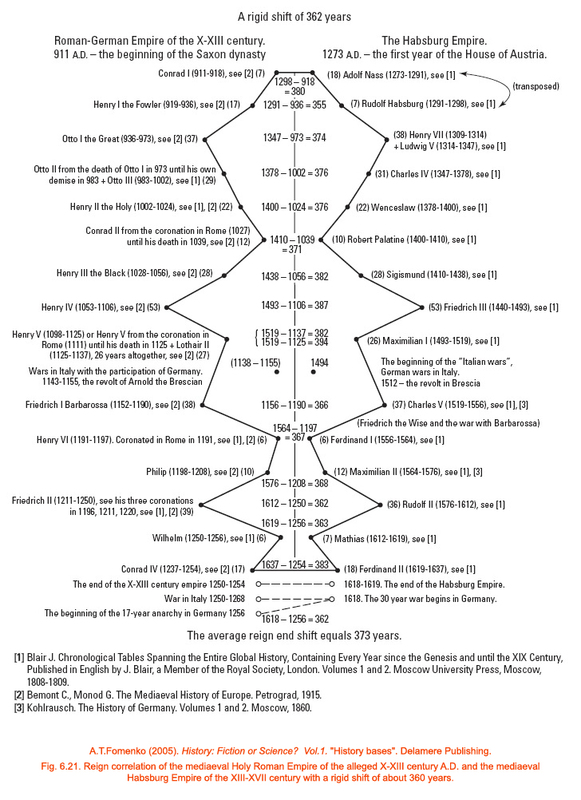 Dynastic parallelism 12 (Click) Reign correlation of the Russian Czar-Khans of 1276-1600 A.D. and the rulers of the Habsburg Empire of 1273-1600 A.D.
Dynastic parallelism 13 (Click) Triple reign correlation of the First, the Second and the Third Byzantine Empire with shifts of 340 and 330 years. Detailed scheme giving names. 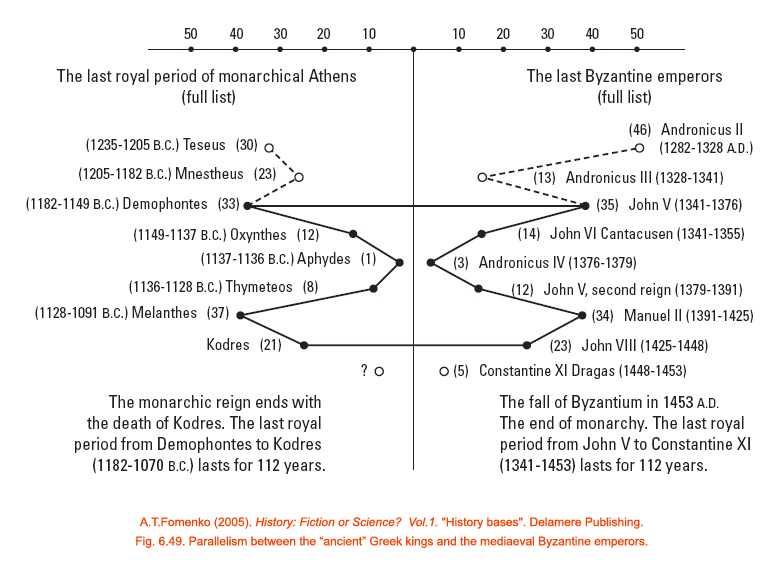 Dynastic parallelism 14 (Click) Reign correlation of the English kings and the Byzantine emperors. 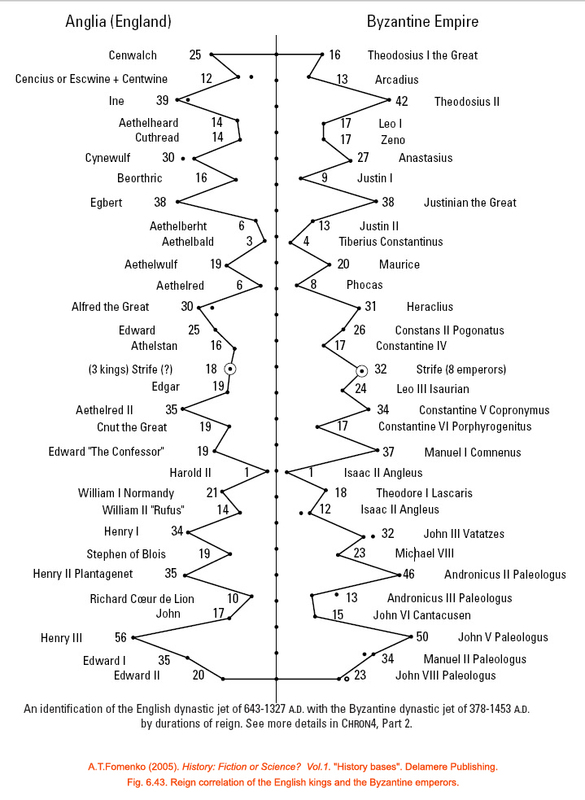 Dynastic parallelism 15 (Click) Parallelism between the “ancient” Greek kings and the mediaeval Byzantine emperors. 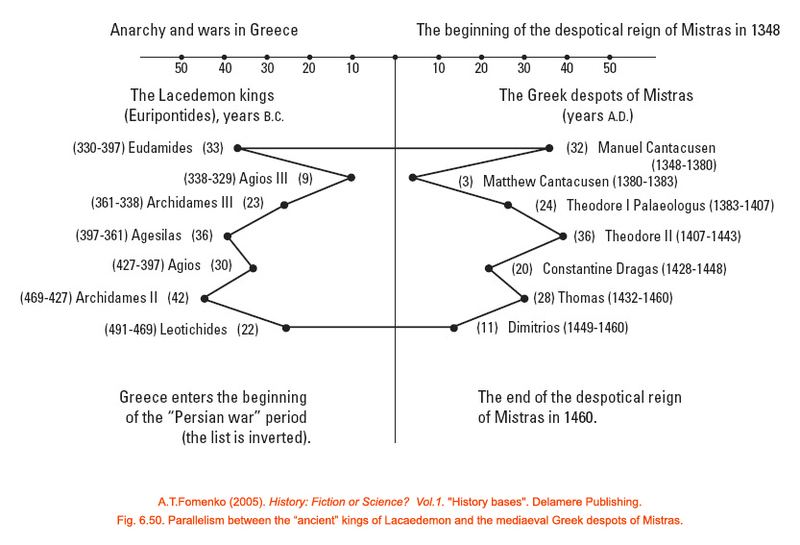 Dynastic parallelism 16 (Click) Parallelism between the “ancient” kings of Lacaedemon and the mediaeval Greek despots of Mistras. 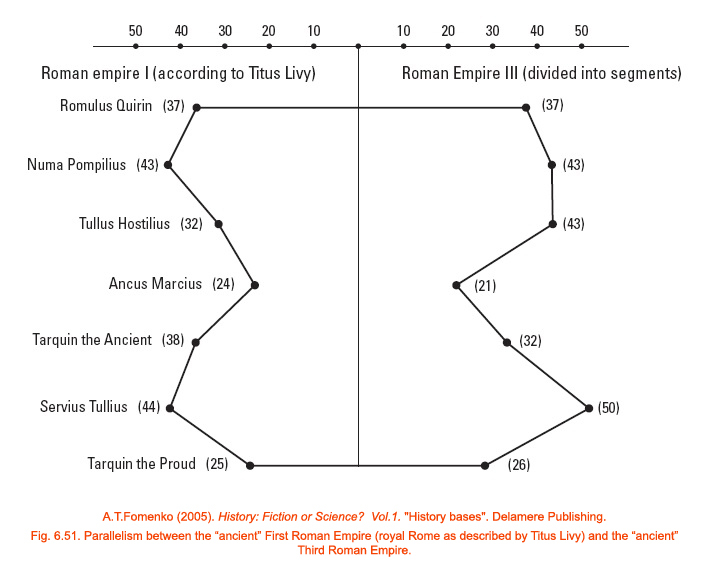 Dynastic parallelism 17 (Click) Parallelism between the “ancient” First Roman Empire (royal Rome as described by Titus Livy) and the “ancient” Third Roman Empire. 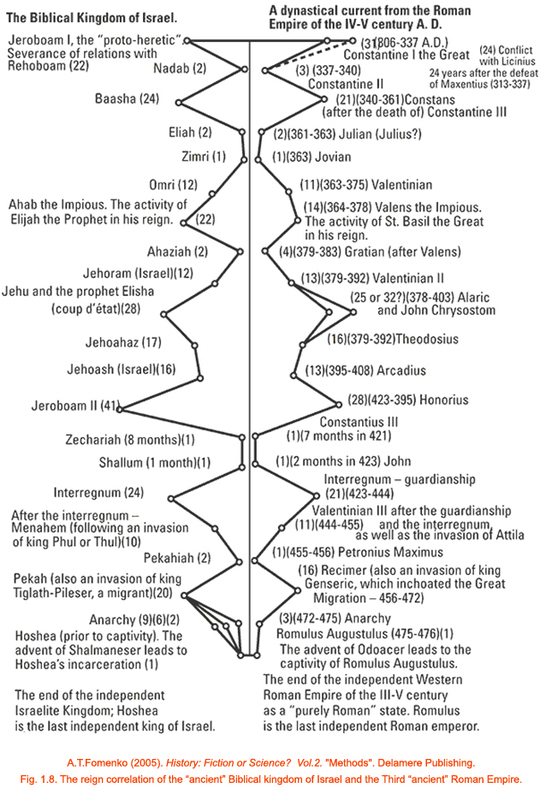 Dynastic parallelism 18 (Click) Dynastic parallels in the “new chronology”. 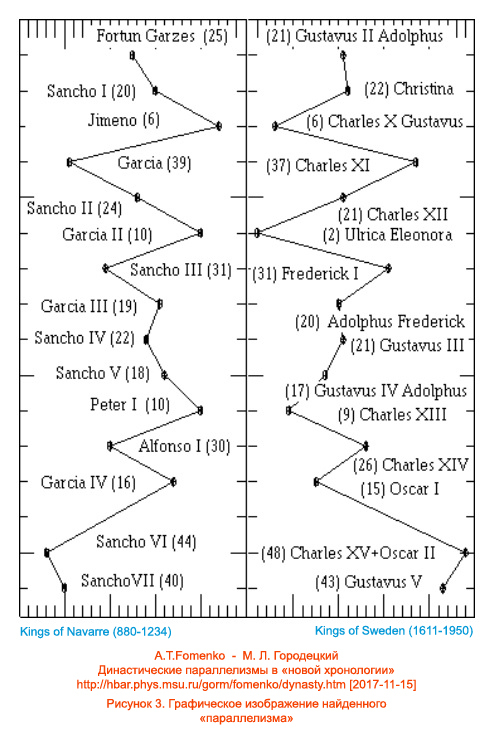 Graphical representation of the found “Parallelism” with the Kings of Navarre and the Kings of Sweden. Exercise done for the Project of the Scientific Direction “New Chronology” -HEB ХРОНОЛОГИJАА- directed by professors A. T. Fomenko and G. V.Nosovskiy.